Arizona Schools: USC only played Arizona and Arizona State (along with Washington and Washington State) once last season, and the games occurred at the Galen Center. This year, USC will only play both schools in the desert. USC was one of the final schools that elite prospect Stanley Johnson was choosing between. Now, it’s unlikely that USC fans will ever be able to see Arizona’s electric freshman play live at the Galen Center during his college basketball career. Byron Wesley: Wesley was the face of USC basketball. He led the team in scoring last season, averaging 17.8 points per game. He scored double-digit points in 26 of the 30 games he played in. He was also the team’s leading rebounder. But the USC captain shockingly announced during the offseason that he was transferring, and eventually decided to play his senior year at Gonzaga. With Wesley not in the picture, USC may not need a singular guy to replace all of Wesley’s scoring. USC was picked to finish 10th in the preseason Pac-12 media poll. Yet, this season Enfield will have tempered expectations because of how young his team is. Next season, with two full recruiting classes under his belt, should be the first season that USC makes some noise in the Pac-12 under Enfield. Darion Clark: Clark sat out last season for USC after transferring from UNC-Charlotte. Even though he is only 6’7″ and 220 pounds, Clark is a physical force who is a tough rebounder and defender. In Enfield’s ideal offensive scheme, the coach likes his big men to be able to stretch the floor. Clark worked on his shooting a lot last year, and he should be a prominent part of the rotation at either power forward or center. Clark was also named a captain, which is quite impressive considering this is his first season playing for the Trojans. Elijah Stewart: Stewart is the second-highest rated recruit in USC’s incoming freshman class, and is regarded as the guy who is best suited to replace Wesley. The 6’5″ guard is very strong at attacking the rim, and his high school team (Westchester High School) ran a similar uptempo style as Enfield’s. Freshmen: There are four freshmen on USC’s basketball team this season: Stewart, point guard Jordan McLaughlin, small forward Malik Marquette and big man Malik Price-Martin. With all of the turnover on the roster, the freshmen will have a major role this year, just like last year’s crop. Galen Center: Attendance at the Galen Center has been a big problem in recent seasons. The last time USC’s home attendance average was at least 5,000 people was in 2011. Last season, the average home attendance was 4,370. To compare, in USC’s road games, the average attendance was 7,926. Halves: Last season, USC wasn’t really a good first or second half team. The Trojans were outscored 1,153 to 1,069, for an average first half deficit of 36.0 to 33.4. USC’s offense picked it up in the second half, but the defense slipped, as opponents outscored them 39.3 to 37.2 in the final 20 minutes. International Players: Nikola Jovanovic may have been the most pleasant surprise for the team last year. As a freshman, he averaged eight points and four rebounds per game, including putting up 23 points in USC’s big upset over Cal. 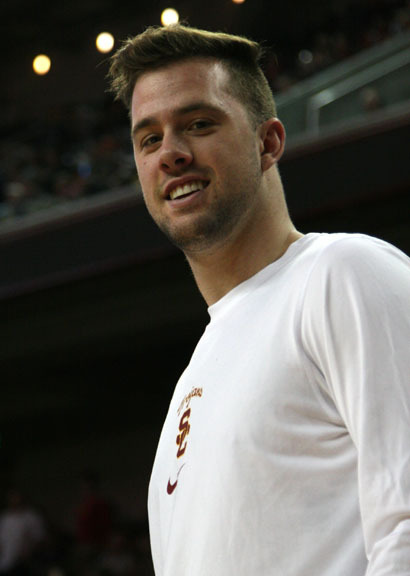 Jovanovic represented USC on the Pac-12 Basketball All-Star team in exhibition games in China this summer. He also gained 25 pounds of muscle in the offseason, which will serve him well if the team is planning at playing him at center. Strahinja “Luis” Gavrilovic is the other Serbian that will have a role on the team this season. The junior averaged only 1.4 points per game in USC’s first 15 contests, but increased that mark to 4.3 PPG in USC’s final 17 games. Julian Jacobs: Jacobs played in all 32 games as a freshman last season, and he was named the other captain of the team a few weeks ago. Out of all Pac-12 freshmen, Jacobs finished second in both assists and steals per game. Jacobs is a very strong distributor and is quite active on defense. USC’s success is very dependent on Jacobs, and his play will be a huge part in dictating how USC finishes this season. Katin Reinhardt: Reinhardt is USC’s second big transfer that will get to play after sitting out the previous season. He played his freshman season at UNLV, but transferred closer to home. He is a strong shooter, and is expected to lead the team in points. Even though he’s 6’6″ and can knock it down from anywhere on the court, Reinhardt also likes to be a combo guard and play a distributor role as well. Last Place: USC has finished in last place in the Pac-12 in two of the last three seasons, including last year. Over that span, the Trojans have a combined 12-42 conference record. While USC is still projected to finish close to the bottom this season, bottoming out completely for the third time in four seasons would be inexcusable considering the talent on the team. McLaughlin: Jordan McLaughlin was the highest-rated recruit in USC’s incoming freshman class, and he has wowed the coaching staff in practice leading up to the season. The point guard has shown that he is a major threat on offense, and he will be a floor general for the Trojans early in his career. USC’s freshmen played a lot last season too, but McLaughlin has a chance to be the most talented freshman USC has had in years. New Mexico: USC’s biggest non-conference game is at New Mexico on November 30th. This is the second straight season that the Trojans are traveling to a rowdy Mountain West Conference arena, as they lost to Utah State last year. The Pit is widely viewed as one of the best atmospheres in college basketball. Even if this New Mexico team isn’t as good as last year’s, this will be an early challenge and benchmark. Omar Oraby No More: The 7’2″ big man played at USC for two seasons after transferring from Rice. While his questionable effort and inconsistency summed up his disappointing USC tenure, he was still a big body and a solid rim protector. Now the Trojans only have two players that are taller than 6’9″, which will cause issues with post defense and rebounding. Pac-12: USC was one of the few teams in the Pac-12 that improved this offseason. NCAA Tournament teams such as UCLA, Stanford, Arizona State and Oregon all lost significant players to the NBA or via dismissal. Arizona and Utah are widely considered to be the top two teams in the conference, largely in part to their stable offseasons. The Pac-12 is not as loaded compared to last year, so USC should be able to pick up a few more conference victories. Question Marks: The two biggest questions marks on this team are youth and size. Coach Enfield mentioned an interesting point correlating the two, as older players usually have more developed bodies and are stronger than the underclassmen. So not only will USC have to deal with height differential, the Trojans will also be facing more mature and physical players. Additionally, I’m wondering how often Jordan McLaughlin, Julian Jacobs and Katin Reinhardt will play on the floor together, since those are USC’s three biggest playmakers. Recruiting: USC’s incoming class was ranked 23rd in the country by Rivals. USC’s 2015 class is ranked 20th, as two top-60 recruits, Chimezie Metu and Bennie Boatwright, have already committed. Assistant coaches Tony Bland and Jason Hart are excellent recruiters, and have a strong grasp on the high school basketball scene in California. The fact that USC was legitimately in the running for Stanley Johnson tells you just how strong USC is at recruiting. High school players watching the young players on USC getting early playing time will only help the Trojans’ pitch. Shooting: USC shot 43.9 percent from the floor last season, which was actually better than how opponents shot against the Trojans (43 percent). But, USC’s perimeter shooting was awful. USC made 29.1 percent of its three-point shots, down a whopping five percent from the previous season. The addition of Reinhardt will improve that number, but in order for the team to thrive under Enfield’s offense, they will ideally need at least three perimeter shooters on the floor for spacing. Tempo: In Enfield’s first season as coach, USC finished 26th in the country in adjusted tempo. But playing at such a fast tempo last season wasn’t the best idea. Let me explain: When your team is less talented than your opponent, you want to limit the number of possessions. If you’re playing in a 1-on-1 game versus LeBron James, would you rather have the game be to one point or 11 points? Obviously one point, because you have a better chance to win the game on one possession than several possessions since LeBron is much more talented. Last season, USC’s tempo allowed opponents to have more possessions, and the talent gap played a bigger factor. Will it be a disadvantage again this year? Underdogs: USC hasn’t been favored in many games recently, and were often double-digit underdogs in conference play. But, USC did pull off three big upsets last season, including a buzzer-beater overtime victory over eventual NCAA Tournament Cinderella Dayton. USC’s biggest home upset last season was a 77-69 win over Cal. Even though the talent gap is shrinking between the Trojans and other Pac-12 teams, USC will have to embrace the underdog role for at least one more season. Very Weak Non-Conference Schedule: There are a lot of marquee games involving Pac-12 teams before conference play, but USC doesn’t play in many of them. In fact, New Mexico is the only NCAA Tournament team from last year that USC will play on its non-conference schedule. Even though a weaker non-conference schedule will not help USC’s resume later in the season, piling up wins early can help this young team’s confidence versus getting beating up by better competition. Wins Prediction: USC should have a winning non-conference record. In those 12 games, I think the Trojans will lose to New Mexico, Vermont, Utah State and Akron. USC is playing Akron in the Charleston Classic, the early season tournament the Trojans are partaking in this year. 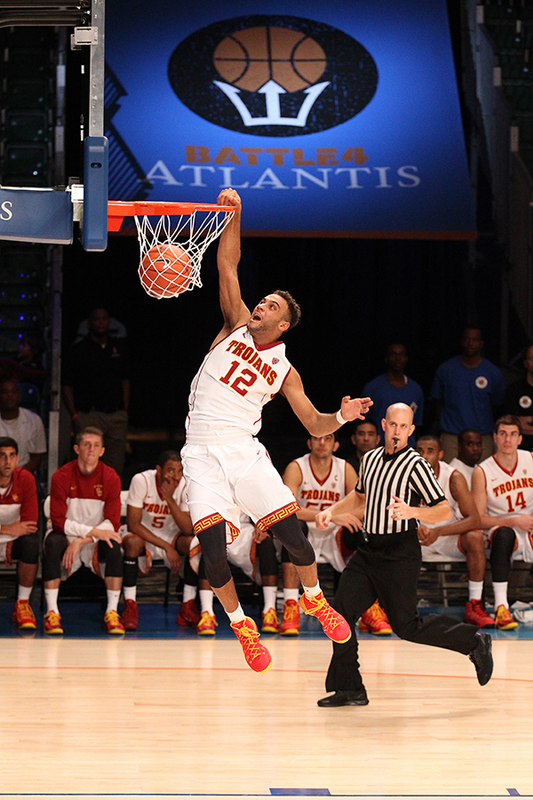 The early season tournament USC played in last year was Battle 4 Atlantic. In conference games, I think USC will beat Oregon State twice, Washington State, Cal, Oregon and Colorado. So overall, I have USC winning 14 games in the regular season, which would be a three-win improvement. X-Factor: Now, I think USC’s best player this season will be Nikola Jovanovic, but a team’s best player isn’t necessarily the X-factor as well. I think Julian Jacobs is the X-Factor, just because of how many ways he can impact a single game. He can score, pass, rebound, defend and lead. He also does a lot of things that don’t show up in the box score. When Jacobs played well last season, USC looked better as a team. That trend will continue this season. Youth: I know youth has been mentioned a lot, but that will be a reoccurring theme with this team. Only three players out of the 14 listed on USC’s roster are legally allowed to drink in the United States when the season starts. The coaching staff is filled with a lot of younger guys as well. This is a team that will be learning together from each other, and will grow throughout the season. 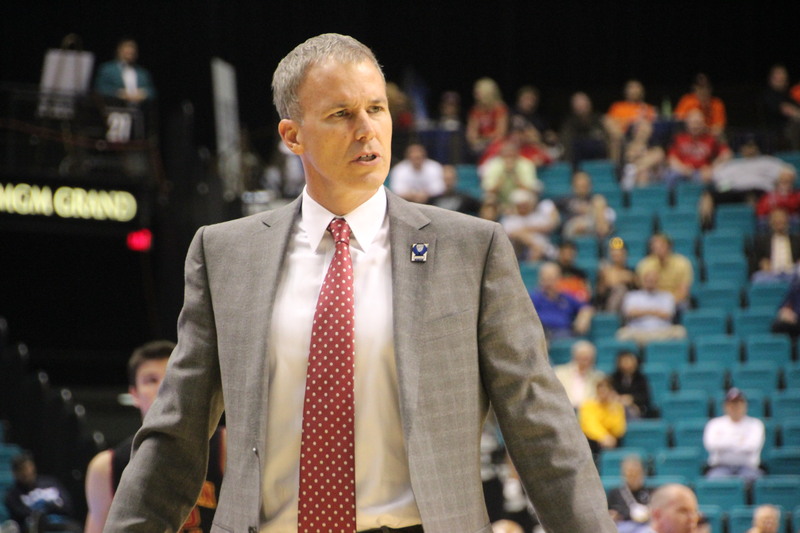 Zero Seniors: Coach Enfield said this is the first college basketball team that he has ever been a part of that does not have a single senior on the team. He noted, however, that there are a few advantages to being a young team. Enfield said that younger teams tend to be more energetic and hungry, which happens to go along well with an underdog role. Additionally, by giving the younger players more minutes earlier in their careers, USC will have a stronger team in the following years if those players decide to stay until graduation.